Here are two recent articles about Medicare. The first, from the New York Times, points out that some nursing homes are, inappropriately, denying Medicare benefits because individuals are not "improving." The second, from AARP, is a comprehensive discussion of the potential effects on current Medicare recipients as the new Congress and Administration begin to act on their stated intention to repeal the Affordable Care Act. By way of disclaimer, AARP is, of course, an advocacy organization, and ARCRA does not endorse their positions. or those of any other entity. But we do recommend the article to you for its thorough coverage of what could happen in the months and years ahead. Retiree Connection volunteers offer important services to Red Cross retirees. They help renew relationships or contacts with former Red Cross colleagues, help take advantage of services and products and other benefits, and advocate in negotiating the system and resolving retirement-related problems. Formed about 12 years ago by a small group of retirees from Southern and Northern California, Oregon and Washington State, the Retiree Connection has developed and expanded. Today, while every so often a “connection” is requested, most of the work done by the volunteer group manning the phone messages is related to information and referral for retiree benefits, untangling frustrating breakdowns in communication about these benefits, and once in a while, assisting an elderly retiree through a confusing time in their lives. As the years have passed, problems related to working through electronic tools such as websites, emails, etc., have lessened as our retiree population becomes more used to dealing with these tools. In addition an excellent ARCRA website is becoming more and more used by the retirees. But there are still occasional issues that we are called upon to address, and retirees who still aren’t skilled at these electronic tools. Retiree Connection volunteers have added some tasks, one of which is to pick up the ARCRA office calls and handle those that fall into our area of expertise, passing on the others to our ARCRA Administrator. This hasn’t added a large load to the weekly duty, and Retiree Connection volunteers are happy to be able to help out. Now, the Retiree Connection is looking into other ways to add services to our retiree population, such as doing mini surveys and forging better partnerships with local Red Cross chapters and area offices. The Retiree Connection looks at extending the volunteer team from the original San Francisco Bay Area team to a more nationwide group. Meanwhile, the group of six Retiree Connection volunteers, including two from the original group, chaired by Helen DuBois, continues to take the messages left from our fellow retirees, lending them a hand with their problems and concerns. You can reach a Retiree Connection volunteer by calling 1-800-738-2724. Seven and a half cents doesn't mean a thing. Truth in Advertising I: Seven and a half cents in 1954 translates to about seventy cents today, representing a cumulative inflation rate of almost 800%. A lesson in itself. Truth in Advertising II: If there were 40 inch television sets in 1954, we don't remember them. 21 inches was pretty much the big screen standard in the mid-century living room. On the other hand, today's models commonly exceed 60 inches with some systems topping 100 inches. That's another form of inflation! For most retirees, the Red Cross defined benefit pension has increased by 1% a year every January like clockwork, and we can reasonably hope this practice will continue. By contrast, the increase to our Social Security benefit for 2017 is 0.3%, there was no increase at all in 2016 and in 2015 the increase was 1.7%. Over these three consecutive years Red Cross pension increases add up to 3% while Social Security's come to just 2%. Will this always be the case? Certainly not. Interest rates are likely to rise, and with them inflation will creep upward (moderately, we hope). When that happens, Social Security annual increases, which are based on inflation, will exceed our 1%. But the point here is balance. We see that in times of low inflation our 1% per year can exceed the increases from Social Security. When inflation climbs, Social Security payments will too, and higher interest rates will mean more opportunities for other forms of saving to grow more aggressively. Again, the key factor over time is balance. Our life expectancies are increasing, and those 1% annual jumps look a lot more significant when they're compounded over 20 years--or many more! We are fortunate to have a defined benefit plan. Only a small minority of retirees still has one. The defined contribution plans like 401(k)s that the Red Cross and most other employers have adopted for new hires can work very well, but they only deliver full value when the employee is both a disciplined saver and a knowledgeable investor. It's up to workers and retirees to manage these plans themselves, and they often make serious and sometimes catastrophic mistakes, including contributing too little, balancing their portfolios poorly and withdrawing too much too soon. By contrast, defined benefit plans like ours feature professionally managed portfolios and regular payouts. And remember, we were never required to contribute a penny into the plan during our working years. With all that said, should we rely on the combination of Social Security and our Red Cross pension to meet our retirement needs? The answer is no. Recall the "lesson of the three-legged stool" from those pre-retirement seminars. Financial independence, they said, will flow from three sources: your pension, your Social Security, and your personal savings and investments. And they were right. If you find that you've neglected that "third leg" over the years, is it too late to do something about it in retirement? Maybe not. For many retirees there are prudent strategies available to generate additional income. The key to finding them is a good, unbiased financial planner who is willing to assume a fiduciary role. When I became Executive Director of the Mid-Fairfield County chapter we decided to fly, in addition to the American flag and the American Red Cross flag, those of the Red Crescent and Israeli Magen David Adom, symbols that also represent members of the International Movement. Our chapter was close to New York City, and our area had a strong international flavor. The display of the three flags drew many inquiries, often from people who wanted to learn more. I remember a conversation with a community member who was curious about the Red Cross symbol: he was delighted to learn it wasn’t just a sign of assistance, but that it was the reversal of the Swiss flag. And that the symbol was chosen because visionary Swiss businessman Henry Dunant saw the need for a humanitarian organization after witnessing the Battle of Solferino and its aftermath. It can truly be said the genesis of the Red Cross movement was a commitment to members of the military. In America, Clara Barton continued this tradition during the Civil War with a commitment to the care of the wounded and dying. This commitment carries through today. Often, when in my office at the Red Cross, I would be told that a member of the military came to ask for some kind of assistance. Whenever I could, I made a point of giving these visits my immediate and personal attention. This created more opportunities to talk to members and veterans of our military about our roots and our fundamental principles. With the exposure we have to worldwide events it is important for our members to understand our international connections, whether it is another Red Cross member responding to a disaster as we saw in Nice or the Red Crescent helping the Middle East refugees. Along with our board and our staff, I truly enjoyed sharing information about the International Red Cross with our own community. In the same spirit, as an ARCRA board member, I will periodically be writing about international matters for our Association’s members, to help all of us tell this larger story to others. ARCRA is partnering with ARC Biomed, specifically with the Volunteer Managers, to recruit volunteer transportation specialists to deliver lifesaving blood to hospitals. This new partnership is an opportunity retirees located within ARC Blood Regions to engage in a true partnership. ARCRA administrator, Christie Phillips, recently met with all 19 Volunteer Managers, and provided background information about ARCRA and a list of possible relationships between regions and ARCRA members and groups. If you live in an area served by a Red Cross Blood Services Region and want to learn more reach out to your local Volunteer Management team located at your regional office. This is the first of what we hope are several opportunities to create volunteer opportunities with clear objectives and impact for ARCRA members and other retirees. Special thanks to Joby Jester, ARCRA board member who is also Mid-Atlantic Regional Representative. Joby has built some of the critical relationships at ARC that enable us to moveforward with this program. If you have any questions about the program, please drop Joby an email or contact Christie Phillips. When in doubt--throw it out! If you receive a suspicious email message, it may be a phishing attempt. Phishing is a type of social engineering attack intended to trick you into divulging personal information. If you receive a suspicious email, don’t click on the links or attachments, and don’t send personal information such as passwords, credit card numbers, bank account numbers or social security numbers by email. October is National Cyber Security Awareness Month- never provide any personal information to unknown sources or respond to suspicious email. On August 25, 2016, the National Park Service turned 100. Buy a Senior Pass for $10, load up the car, head to you closest National Park, and join the Centennial celebration. If you are 62 or older, the best $10 gift you can give yourself is a National Park Service Senior Pass. For a one time fee of ten dollars you can get free lifetime admittance to over 2,000 National Parks, National Refuges, and National Forest Lands. A Senior Pass allows free admission for the pass owner and three additional adults traveling in the same vehicle. This is a big savings. For example, admission to Acadia National Park is $12/person for 7 days or $25/ carload for 7 days. And remember, children 16 and younger always get free admission. You can obtain your pass for $10 at any National Park or Recreation site that charges admission. You will need to present photo id, i.e.driver's license or passport. At a staff Townhall meeting on July 13, Red Cross President Gail McGovern continued her tradition of providing regular updates on the health of Red Cross. While the numbers are not yet finalized, she expects that ARC will finish the past fiscal year in the black. She remarked ARC staff are now relocated from 2025 to Red Cross Square or Fairfax. While the sale of 2025 is not yet finalized, the building is fully rented to The State Department and that rent provides a reliable revenue source. McGovern remarked about how wonderful it was to be out from under the FDA Consent decree and again thanked Biomedical staff for their diligence and commitment to compliance and excellence. She also stated that the financial health of Red Cross is much stronger due to the ongoing efforts of all parts of the organization to control costs and increase revenue. She singled out Biomed, who in 5 years has cut their deficit in half, increased the number of hospitals serviced by Red Cross, increased their productivity by focusing on blood drives that produce more units, and expanded market share in an environment of shrinking demand. Fundraising continues to explore new national giving platforms like Giving Day and Direct Response TV ads. Health and Safety has grown revenue, is more efficient, and expanding its outreach into industry. Service to Military Families increased its casework 38 percent and responded to 270 suicide calls. There is an increased focus on volunteers and identifying work that was formerly contracted out or done by staff including a transportation specialist program recruiting volunteers as blood drivers to transport blood products. 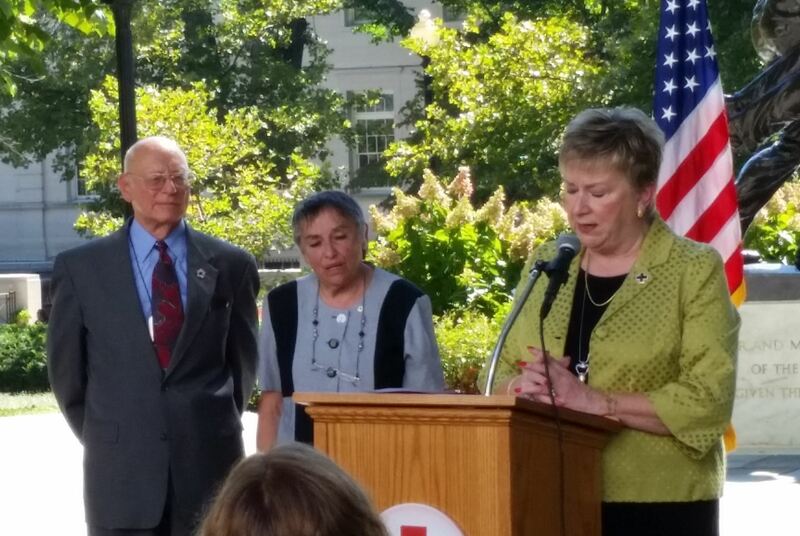 Julie Burger, ARCRA Secretary, former member of the ARC Board of Governors, and lifelong Red Cross volunteer, was recognized for her fifty years of service to the American Red Cross on September 24th at Red Cross Square, Washington DC. Julie was recognized for “a lifetime of exemplary service” through her Red Cross volunteer work and her work in the community. Much of Julie’s Red Cross volunteer work was in SAF, as a case worker and trainer, working on many military bases as she accompanied her husband during his military career. She also developed the “Get to Know Us Before You Need Us” program. Julie was recognized at the annual memorial service, a Red Cross and American Red Cross Overseas Association (ARCOA) event. The annual event honors the lives of ARCOA members whose “enduring bonds of friendship” were forged in service of others far away from home. ARCOA membership is made up of Red Crossers who served overseas and seek to promote international understanding, promote community service and maintain the friendships that they established while on Red Cross assignment. Today ARCOA members include those who served during World War II, the Korean Conflict, Vietnam,and most recently in Afghanistan, Bosnia, Djibouti, Kosovo, Kuwait, and Saudi Arabia. In addition to serving with U.S deployed military, ARCOA members also include those who have served in international humanitarian relief missions in the aftermath of devastating natural disasters in support of other Red Cross societies and as part of postwar relief efforts for civilians. Your kid comes home from school with an empty pillowcase and a list of disaster preparedness supplies to fill it with. That's the big take-away when youngsters participate in The Pillowcase Project, a Red Cross program sponsored by Disney. Along with the pillowcase, there's on online book and an app to help the third through fifth graders learn about fire prevention, family preparedness, and how to cope with disasters. The Pillowcase project got a tremendous boost in late July when the Red Cross received an AmeriCorps grant of just over a million dollars from the Corporation for National and Community Service. The money will be used to deploy 60 AmeriCorps members across 15 states to send 60,000 youngsters home with their pillowcases. 20 more AmeriCorps members will distribute free smoke alarms and teach adults about home fire safety, with the goal of reducing deaths and injuries due to fires by 25 per cent over five years. Families of the military and veterans will be a special focus of the joint effort, with 10 of the 80 AmeriCorps workers assigned to work with them.